details. 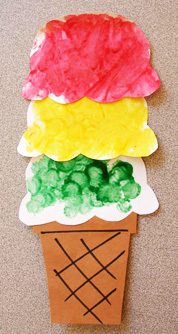 Kids used dot painters to paint scoops and glued scoops to cone with glue stick. Have each child to use a spray bottle to dampen a sheet of white construction paper with water. help the child to glue on a torn strip of blue paper to simulate the ocean's waves. Cut sunglasses shape out of cardboard. Glue on colored saran wrap to make lenses. dry for 24 hours. The ice cream mixture will puff up and some of it will run, giving the effect that the ice cream is melting. sidewalk or patio. Let the children use a hose to wash away the chalk designs or leave them until the next rainfall. Fill spray bottles with food color water and let the kids spray the sandbox sand. You'll have your own painted desert. Then show them how to magically return the sand to normal by turning over with a sand shovel and start again. is sprinkled on the glue and the excess is shaken off. An umbrella and a beach ball are then glued on the paper. sailing, summer sports, swimming, etc. 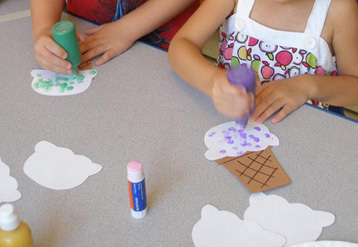 Glue them onto the paper to make a summer collage. Mix a small amount of sand into the paint to give it a textured look and feel. Give the children a piece of paper and let them free paint with the textured paint. Dip or paint child's hands yellow and put them down on a paper in a circular pattern (like the sun). We added faces and smiles! They were really cute and looked great on the bulletin board! sizes. Dip each one in a color of washable tempera paint. Have the children throw the balls at the paper. stamps. Let them use their bags for packing lunches before going outdoors for a picnic. An outside area, near dirt or sand. chairs next to pans of paint along the edges. Place a bucket of soapy water nearby. Have the children sit in the chairs and dip their feet in the paint. Then have them dip their painted feet into the sand or dirt. Let them walk along the paper, leaving "dirty" footprints. Have them wash their feet in the soapy water when finished. Sand is squishy when wet. Sand helps us to not slip in the wet paint. We leave footprints when we walk. Soap and water make us all clean again. Let each of your children flatten a paper baking cup and decorate it with crayons or felt tip markers. Show the children how to make a butterfly shape by pinching together the center of the flattened cup. Then help each child twist a pipe cleaner around the pinched center and curl the ends to resemble antennae. the brown area. When the paint is dry, cut around the flower shape. Draw or trace a large sunshine shape on yellow construction paper and cut it out. which a lot of gold glitter has been added, "paint" the pointed rays of your sun. in a window and you have a beautiful sun catcher. slit the stem of one dandelion close to the flower, then feed the stem of another one through it. (You will need dandelions with thick stems for that one). Make some bracelets, necklaces, anklets, headbands etc!! from the box and sets it aside to dry. use while playing in their box house.... for example, plastic food, dishes, and so on. We created sun tambourines. Start with paper plates, and paint them yellow. We cut out eyes from black construction paper and and made them a face. the edge. The kids loved them and the parents thought they were great as well. children decorate butcher paper "beach towels" to use as a background display for their shapes. If you have a sandbox, wet down the sand and build sand castles. Mix together two parts liquid starch to one part water. Cut cheesecloth into 4 to 5 inch squares. dry for several hours or overnight. Once the sun catchers are completely dry, hang them in a window. hand shapes out of green construction paper for palm fronds by tracing their hands onto the green paper. Let your children glue or tape their fronds to the inside of the top of their tissue tube tree trunks. From different colors of construction paper, cut out shapes that resemble the frozen part of Popsicles. them glue on plain craft sticks for handles. Encourage the children to use the puppets for telling stories. Have the children cut out pictures of people doing things out in the sun. them what is happening to the powered paint. What has happened to the ice cube? Use squirt guns to draw designs on the pavement.